The best way to experience holiday stress relief is to plan your holidays now, and take small steps to make sure that everything gets accomplished that you want. Therefore, this week we're tackling several more tasks, focusing both on the closest holiday, Halloween, and also getting ready for Christmas. Plus, we'll get ready for any traveling you may have planned for either Thanksgiving or Christmas with family or friends. 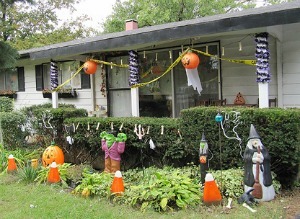 With just a few weeks before Halloween it is time to get out your Halloween decorations, and begin putting them up. Nothing helps you experience holiday stress relief more than putting up the decorations when you want to, instead of in a mad rush before the trick or treaters arrive. You can do this as a project, where you get out all the decorations and put them all up, all at once, if you have the time. Or, you can do just a little bit each day this week and still get the job done. Make sure, whether you do it all at once or just a little at a time that you budget time for pulling everything out, and putting stuff away at the end, such as the boxes the decorations are stored in. You definitely don't want boxes sitting around for a month until it is time to put everything away. 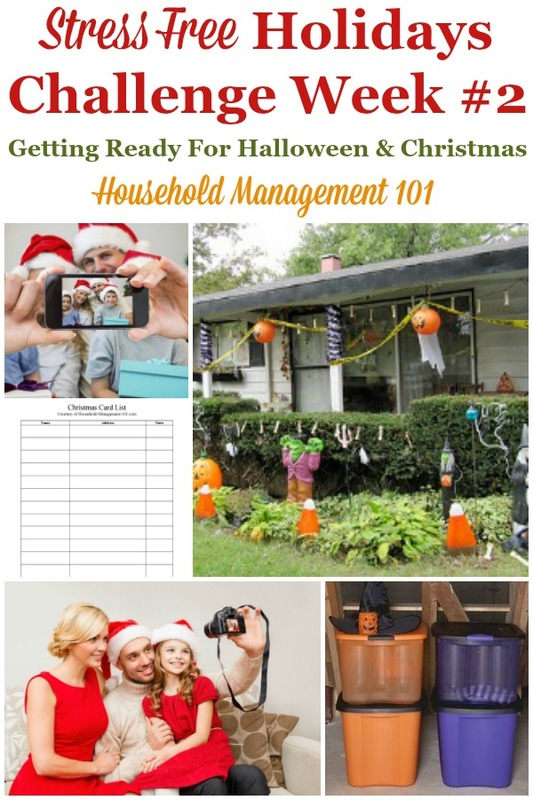 In addition, think now about how you want to store your decorations once Halloween is over. 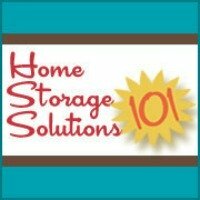 Do you need more storage containers, or do you need to just get rid of some things you never use anymore? Do you need to label things better, or make more room in the attic or basement for the stuff? Slow and steady preparations make it easy on you, but still get the job done. Please note that I don't suggest starting your pumpkin carving, and that type of decorations this early, because the poor pumpkin will rot may rot before Halloween (although, if you wish to carve now, make sure to use these tips for preserving carved pumpkins). Instead, this assignment is for Halloween decorations you use every year, and are stored for the next year. Getting ready for Christmas in a stress free, not last minute way, takes some time. Believe me, though, if you do these tasks now you will experience holiday stress relief later. 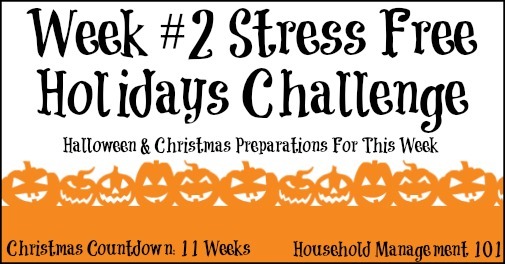 Just like last week there are two tasks to do this week to get ready for Christmas. Task 1: Plan To Take Your Family Christmas Photos - Many people like to send, with their Christmas cards, or as the card itself, a family Christmas photo. If you want to do this, this year, you will need to go ahead and make plans to have your family's picture taken in the next week or two. Otherwise, especially if you want to purchase photo Christmas cards, you will not have enough time to order them, get them back, and address and send them all out before the holiday rush is upon us all. Part of experiencing holiday stress relief is getting things done before things get too hectic. Along with arranging when to take the photo, if you want everyone to wear something in particular make sure it is clean and pressed, so go ahead and get that done. You also don't want to realize you need to go buy clothing or accessories at the last minute, so plan for this also. Family Christmas Photo Ideas & Tips - This article shares my best tips for all the aspects of taking your family Christmas photos, including clothing, timing, location and poses, plus my recommendations for where to get your own Christmas photo cards. Task 2: Consider And Schedule For Homemade Gifts And Brainstorm Other Gift Ideas - Last week part of the Christmas preparations included thinking about who you wanted to give gifts to. Now, this week I want you to consider ideas for what you want to give them. Next week we will consider and make your holiday budget, so don't completely commit yet, but at least get some good ideas so you can better estimate what it will cost you and what you need to commit to the budget. If you figure out all this will cost too much, this gives you time to rethink various gifts without getting panicked and stressed trying to think of last minute gift ideas. This is also the time to begin thinking about any homemade gifts you want to give. Remember that homemade gifts cost both money, for supplies, and time. Therefore, keep these two factors into consideration when deciding what to give, and to whom. Also, remember to consider any homemade presents your children may want to make. Depending on their age, you may need to budget and commit time to help them with their gifts, or to get supplies together. If you and your family love making gifts and crafts consider setting aside a special time each week where all family members can work on their projects together. This can, in itself, be a fun holiday memory and tradition. 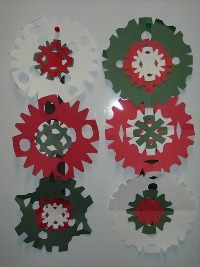 A good resource if you want ideas of things to make is my friend Toni Anderson's Homemade Christmas Gifts Kindle book. Toni, from The Happy Housewife, has provided 60 different gift ideas that can be made by real-life moms on a real-life budget. The final thing you need to work on this week is any travel plans you and your family may need to make for either Thanksgiving or Christmas travel. I understand that while some people host holiday gatherings in their own homes others drive or fly across country to be with relatives and friends. If you're a traveler, go ahead and think about what you need to accomplish to get to your destination this year. Go ahead and book your airline tickets, rent a hotel room, begin budgeting money for travels, get your oil changed -- whatever it is that you need to do to make sure you travel in a stress free manner. If you missed the previous parts of this series, you can still jump in. There is always time to start. If you're participating in this challenge tell me how it's going for you below, so we can all celebrate our baby step successes together! After all, we should be cheering each other on in our quest for reducing holiday stress.